Yesterday we stopped by Goodwill on our way to my least favorite store in the whole world (stupid Walmart!). We were going to make a return. Luckily out here Targets are a lot closer than Walmart. I think I've only had to go to Walmart twice since we moved here 5 months ago. Anyway...at the Goodwill store, I found this incredible vintage ribbon. 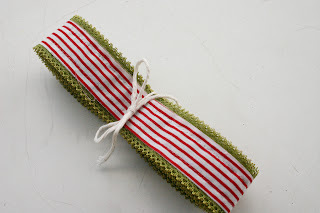 It's a fabric ribbon backed in lace of the most wonderful color of green. It's gorgeous! 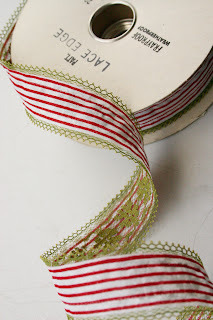 Just imagine how perfect this ribbon would be for Christmas wrapping & decorating. Or to add to scrapbook pages or to use in holiday card making. Oh, I love it! The most wonderful part of thrifting is when you spot something (like this ribbon) sitting among all the junk & it just makes your heart stop & you can't help but gasp. I guess it's what keeps me going back for more. Anyway, little bundles of this divine ribbon will be up in my shop later on today. You have such an eye for these things. I don't think I could ever pick out anything of worth at a thrift shop. You have such a talent!